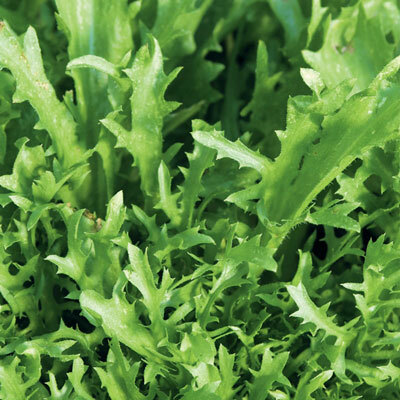 Glory Endive | Henry Field's Seed & Nursery Co. Perk up that summer salad with the crisp, lacy leaves of Glory. As delicious as it is pretty, this frisée endive has a nice nutty flavor and adds an appealing texture to warm-weather fare, such as crudité trays. Play up Glory's attractive qualities by using the exotic leaves as a plate liner for potato, chicken and tuna salads. Hand-size heads are easy to harvest. 80 DAYS. For each offer ordered, get approx. 500 seeds pkt..
Botanical Name: Cichorium endivia 'Glory'. Spacing: 8 - 12 inches once thinned. Foliage: Lacy green and cream foliage. Fruit: Hand-sized heads of lacy leaves with a creamy heart.